Balance sheet 2012: a comeback that's come to a standstill! The 24th festival team believed in it: this season we would find a venue that would mark a new epoch of stability for the festival, like Kremlin-Bicêtre and the Trianon. And Sunday evening, whilst packing up the equipment after the festival-goers had left, we were already making plans for 2013... the Ménilmontant theatre board had decided otherwise, to our great surprise, and the energy spent on breaking-in this new space will have to remain an experience with no tomorrow, leaving us with mixed feelings: proud and frustrated. Proud, yes, because this 24th festival held its promise in terms of a return to a multiplicity of activities and interactions: 73 films from 21 countries, the transmission screening on leading film directors in experimental cinema, 4 debats, 2 meetings, the art exhibition presenting work by 12 artists, the opening night concert Helluvah, slam aperetif, the Famba percussionist band and the Gamme'elles, choir, 6 stands (bookshop, T-shirts and militant groups) and a big warm-welcoming space for catering. Frustrated also by not being able to improve on the planning errors encountered this year, which probably contributed to the reduction of subscriptions and entries and in the slightly sub-optimum result of the cafeteria (only +7,7%). The 1 360 recorded subscriptions represents a drop of 9,7% in number and 15,9% in value which can partly be explained by the economic crisis. As for the drop in entries (7,5% in number and 13,5 % in value), it is certainly due to the smaller capacity of the venue in spite of its two theatres (40 sessions against 22 in 2011), but also in the inadequacy of the reservation system. The densest crowds were at the full-length fiction films Margarita (288 entries opening night, 90 in the small auditorium and 78 in the bonus screening), Lengua Materna (310 entries in the large auditorium and 87 in the small auditorium), Yes or No? (290 + 70) and Mosquita y Mari (261 + 93)), the shorts screenings "Plaisirs d’amour" (205 + 106), "Rencontres" (150 + 120) and "Le genre qui doute" (238) and the documentary screenings "Le chaudron des sorcières" (278), "Gazon et crampons" (192) and !Women Art Revolution (51 + 97). With the drop in subscriptions and entries, the decrease in income from the "Printemps de Cineffable" and the reduction of the operating grant allocated by the City of Paris, our resources have receded by 15 % in comparison with the previous financial year. Adding to this the 3 % general increase of expenses gives a result showing a deficit of 12 870 € in 2012. 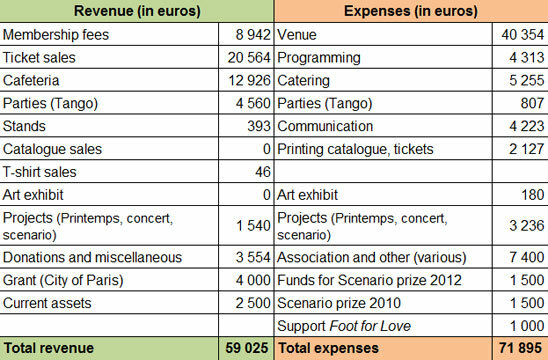 The increase of expenses mostly concerns the venue (more expensive theatre rental, choice of a high definition video projector for the large auditorium), supplies for the cafeteria (compensated by an increase in income) and the settlement of the prize for the scenario competition 2010 of which the winning short film was completed and screened at the festival. Other expenses are under control with little but recurrent increases, which concern the inevitable structural expenses (storage rent, insurance, taxes, contributions). For the financial year 2013, the perspectives are more favourable since the rent for the new venue is less, subject to the anticipation of any supplementary expenses for the provision of a nearby kitchen and of not yet wholly defined equipment rental. The team counts on using their experience, acquired in 2012, to optimize the use of screening rooms and the circulation of the festival-goers while celebrating the 25th edition with dignity.